What digital marketing jobs will be in demand? Is the future of social media headed for disaster? We’ve summarized some key facts & figures for marketers to be prepared for the future. All the way up to 2022. At the end, take a look at the infographic depicting all digital marketing predictions. 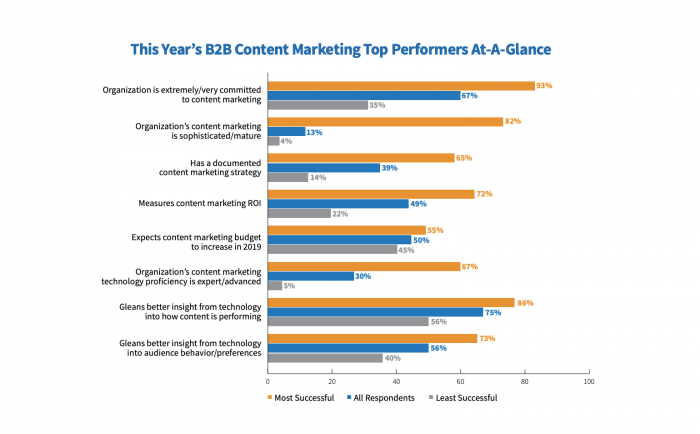 More and more marketers realize the importance of content marketing. According to the report by Content Marketing Institute, 93% of the most successful B2B content marketers reported that their organization is extremely/very committed to content marketing. Companies are changing their approach to creating marketing collateral. That’s where the term content selling comes into the play. This essentially means that content should be created to support sales processes. Marketing teams need to have a strategic approach to content creation and align content strategy with the customer journey. What is more, it becomes crucial to measure the impact of content marketing on sales. This can be achieved by setting the right KPI's for content marketing. How many leads were generated by content marketing efforts? Does my content nurture existing customers and build loyalty? Did you know that the average enterprise uses 91 marketing cloud services? Marketers are overwhelmed by the number of marketing technology vendors. Thus, one of the emerging trends in digital marketing is switching to an all-in-one software. 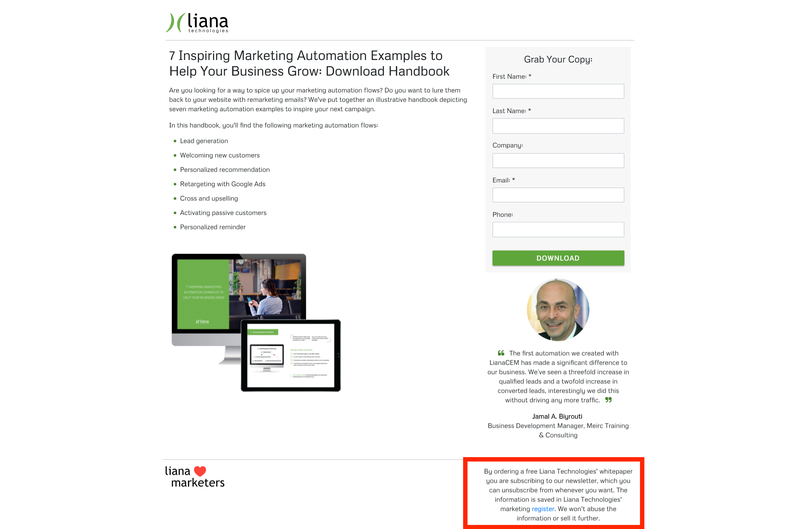 As such, the single sign-on to all Liana Technologies’ tools was designed to improve marketers’ work efficiency and save their time. If you work in the field of marketing, the term banner blindness is most likely familiar to you. People tend to ignore ads as most of them are irrelevant and intrusive. However, even though people feel overwhelmed by bad digital ads, they don't really mind the good ones. According to research by Digital Connections, 49% of people will disregard a brand if it bombards them with ads or if they perceive the advertising to be irrelevant; while 36% of respondents are more likely to buy from a brand that sends them tailored messages. This means, that the future of digital advertising is exposing users only to hyper-relevant ads and using precise targeting audiences. The future of voice-driven search queries seems promising. In the US alone, voice commerce sales are expected to reach $40 billion in 2022. 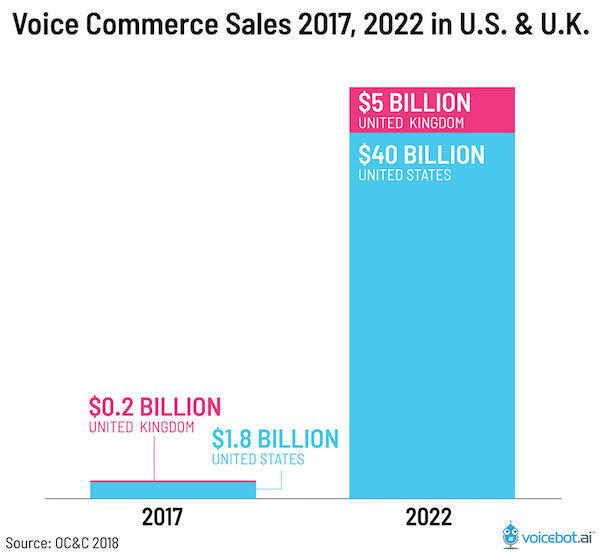 Have you already started optimizing your content for voice search? The explosive growth of Big Data results in a need to critically analyze and interpret enormous chunks of data that companies receive. Therefore, new jobs, such as Market Research Analysts will take off in the near future. Boston University predicts that the position of Market Research Analyst will increase in popularity by 41,2% by 2020. In addition, Growth Hacking jobs are taking off right now. Growth hackers utilize various digital marketing strategies and have a more experimental and lean approach to marketing. While some forms of personalization have been already utilized by companies for a while, fully personalized websites will boom in the near future. Amazon is doing it right: right on the homepage, it’s analyzing your previous behavior and promoting products that it thinks you might want. The increased popularity of technology, such as marketing automation platforms, gradually blurs the lines between marketing and sales. 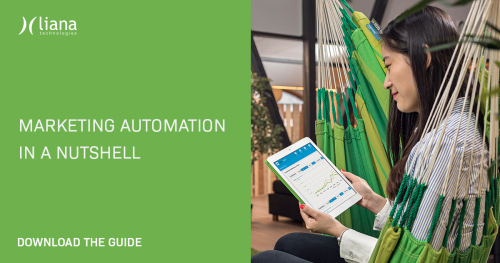 Almost a third of our survey respondents claim that marketing automation facilitates closer cooperation between sales and marketing. Thus, in the future, we can witness a closer collaboration between sales and marketing teams and in some companies, both of them will even merge. As more and more companies have a significant ROI of digital marketing spend, investment in this area will increase steadily. The Drum predicts that the global digital marketing software (DMS) market is touted to grow from $37.48bn in 2017 to $74.96bn by 2022. The market will especially grow due to increased investment in digital advertising. According to CMO, 87 percent of total marketing budgets will be going to digital by 2022. As we already cited in our previous piece about digital marketing trends, Gen-Zers are expected to constitute about 40 percent of all consumers by 2020. That’s only one more year to go. How to cater to this consumer category? Work with influencers. Gen Zers and social media celebs go hand in hand these days. In fact, 86% of women use social media for purchasing advice. Be transparent. Generation Z values transparency and makes their purchasing decision based on that. More about transparency in the next part. 94% of consumers say they would remain loyal to a brand that provides complete transparency. Needless to say, companies failing to deliver transparency and authenticity will miss out. The GDPR regulation that came into force in 2018 showed us the importance of handling customer data in a transparent way. From checking bus schedule to booking a holiday — everything is done with a mobile device today. The penetration of mobile has no sign of declining. According to AdAge, mobile spending will grow to $65 billion by 2020 in the US alone. The development of 5G technology will facilitate the way marketers use mobile data and convey their message online. People tend to spend less time on social media these days. 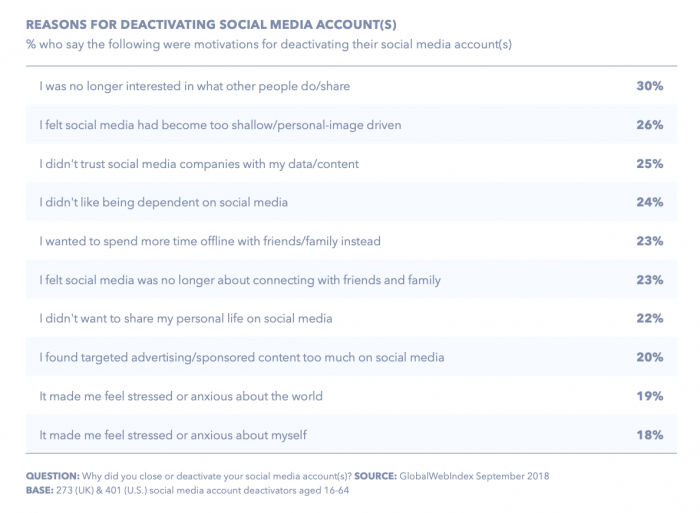 What is more, quite many users are deactivating their social media accounts. 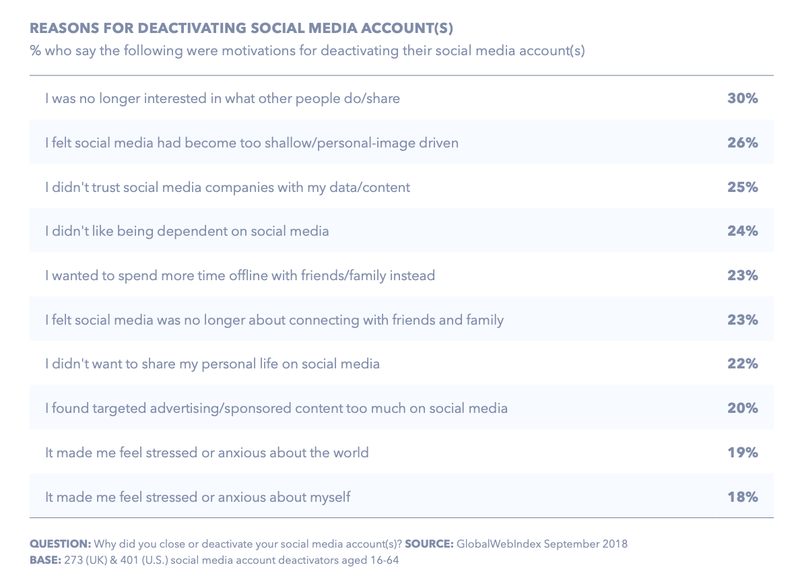 32% of all users in the UK and U.S. say they have deactivated or closed a social media account in the past 12 months, per GlobalWebIndex. Firstly, there’s clearly a need to create more engaging content, for example, by using VR & AR technologies. Secondly, other channels, such as email marketing and PR come to the fore. Just-in-time marketing is focused on creating marketing content that’s needed, when it’s needed, and attuning it to the needs of consumers exactly when they are ready to buy. Accenture Interactive found out that 38% of the companies as just-in-time marketers have grown their annual revenues by more than 25%. How to apply just-in-time marketing in practice? 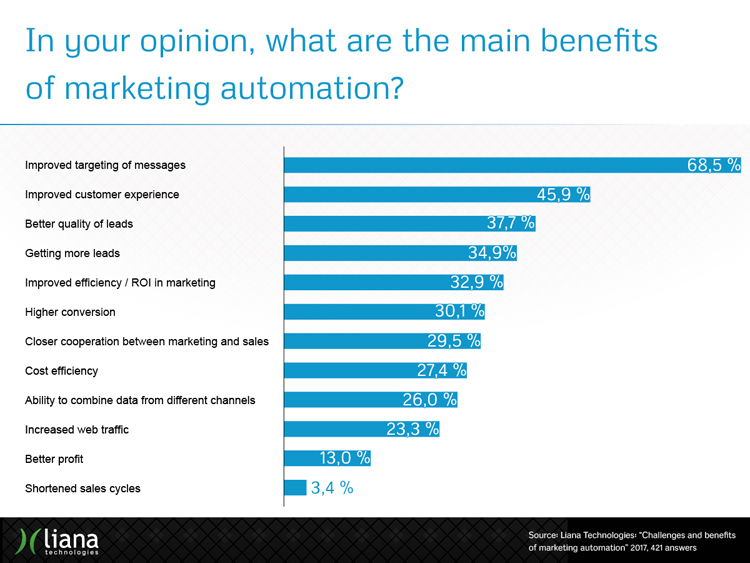 A marketing automation platform will deliver your message at the right time and do a lot of leg work for marketers. We are approaching the stage where AI is no longer a buzzword. AI technologies will soon be incorporated into digital marketing and have a huge impact on it. According to Gartner, AI features will be in almost every new software product by 2020. Our Liana Technologies marketing solutions are no exception. The Liana® PR Cloud contains an AI feature that recognizes the tone of voice of online discussions and journalistic news, as well as analyzes the content to show you only those pieces that you are interested in. It can sniff out where your press releases have been published, and how well they were received. And there are more features yet to come! What other digital marketing trends will come up in the future in your opinion? Share your ideas in the comments below! Thanks for your feedback :) The new social media behavior was also one of the most interesting discoveries for me!